This is a new scarf style that I’ve been working on. This will come in this medium size, a larger and smaller triangle version and also a long cowl. 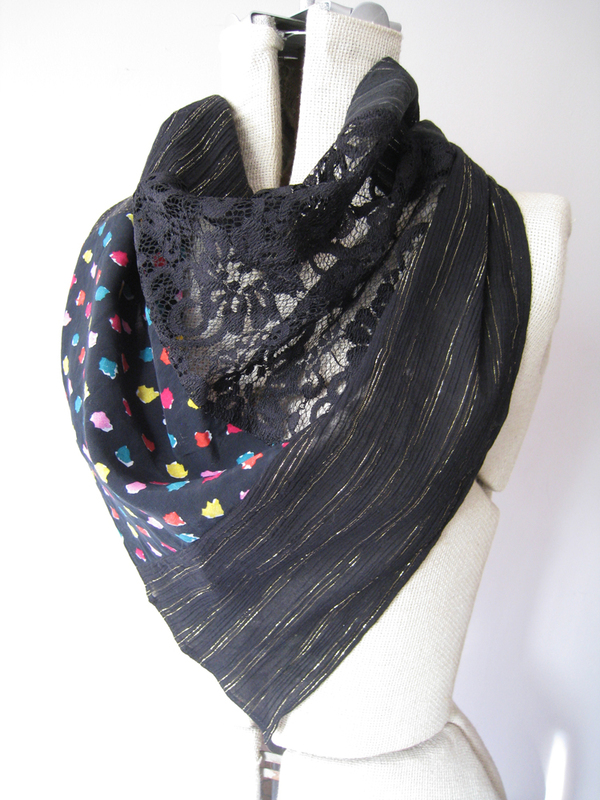 This scarf is a combination of several different fabrics in shades of black. I like the monochromatic look, but I also plan on making more colorful versions with lots of mixed up colors. These are pieced together from scraps of new and repurposed fabrics in soft cottons and silks, sleek blends and even bits of transparent mesh and lace; a blend of texture, color and opacity. You can find this at my Etsy store now and look for other sizes and colors to come soon. Jennifer – I would love to have these patchwork scarves in the store. Let me know if you can whip some up for Spring!